On the cover of Finish-Free Knits, is the Bliss Top. This striking tunic features lace panels, wide ribs, and garter stitch worked in two different directions. 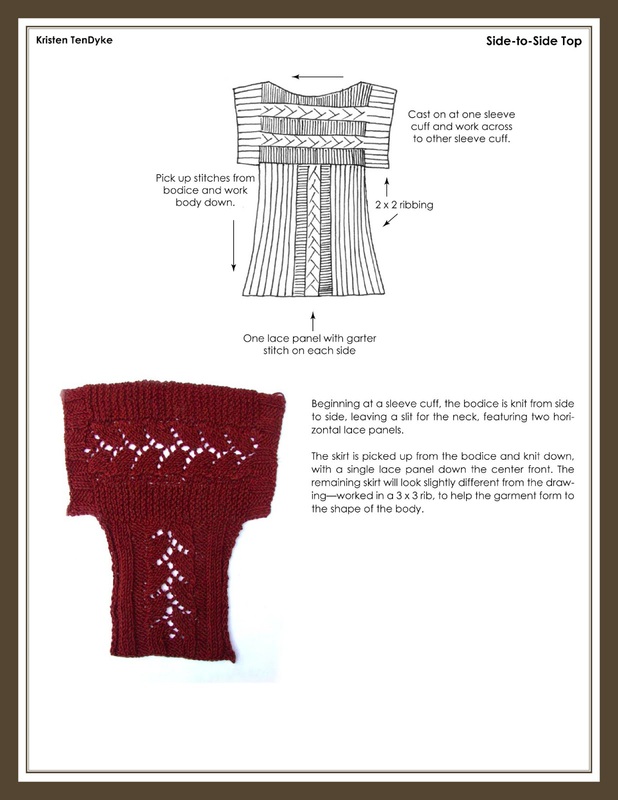 The yoke is worked first from the cast-on at one sleeve, across the bodice, and ends with the bind-off at the other sleeve, with the underarms shaped with a few short-rows along the way. Stitches for the body are then picked up around the lower edge of the bodice and worked in a single piece to the hem. Lovely! Bliss is another one of my favorites. Its construction is a little similar to the Lace and Cable Top sweater I had published in the Spring/Summer 2008 issue of Vogue Knitting. 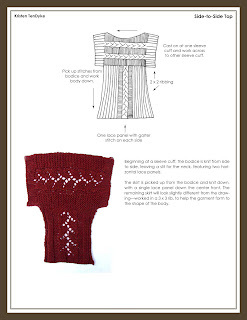 Both begin at the cuff of one sleeve and the bodice is worked sideways across the upper body to the end of the other sleeve. The difference between Bliss and the Lace and Cable top is in the seamless construction and Bliss has the addition of some simple short rows at the underarm. I decided to add the short rows so the edge of the lace and garter stitch portion of the bodice would align with the shoulders without extending into the ribbed sleeves, and add width around the bust for a fitted look and feel—like set-in sleeve shaping. In addition to the armhole shaping for a flattering fit, I also focused on vertical lines. On the bodice, the sideways-knit garter stitch creates delicate vertical lines between the panels of lace, and on the lower body, the ribbing helps visually lengthen the sweater as well as creates a natural waist shaping as they hug the body. This was the pattern that drew me to your new book. Just beautiful. And I was very happy to discover that the book was filled with other wonderful and lovely patterns.